At age 18, DJ Richards is not a typical graduate student. 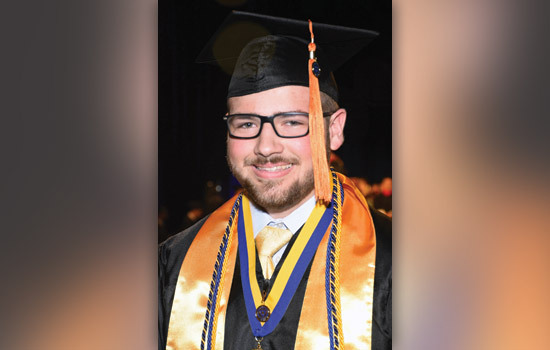 The networking and systems administration major from Howland, Ohio, is coming to RIT after a busy spring—having earned his high school diploma and associate and bachelor’s degrees all at the same time. Now he’ll add a master’s degree to his already jam-packed résumé, which includes six jobs in computing and a business that he started when he was 16. Richards began taking college classes in ninth grade, after being accepted into what is today known as Ohio’s College Credit Plus program. The program allows students to earn college credits for free, while earning high school credits at the same time. In order to focus on his college program, Richards was able to waive some traditional high school classes, including Career Search and Spanish. He does admit that sometimes it was a little weird being the youngest person in a college classroom. Last spring, Richards completed his associate degree in applied business in computer technology from Kent State University Trumbull Campus and a bachelor’s in technical and applied studies in computer technology from Kent State University. Richards has also applied his studies to his own business, working to manage the computer networks of area small businesses. He has also had full-time opportunities, including at Flex-Strut Manufacturing, where he will continue to do work remotely during his degree program. “It’s tough getting companies to understand my particular situation, but everybody has been so great at bringing me aboard and giving me real- world experiences that complement the academics,” said Richards. At RIT, Richards is excited to work with new virtualization platforms, hoping to gain skills that allow him to move up into a management position someday. But, for now, he says the master’s degree won’t be accelerated.